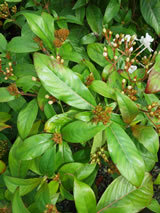 Beautiful lush bushy shrub with bold green leaves. 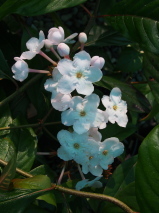 Large clusters of fragrant creamy-white flowers at the branch tips through the winter. Will tolerate light frosts. Prefers a sheltered site. Best in good soil that does not get too dry. Planted under the eaves, allowing the scent into the house.